They've got an exciting evening coming your way July 1. "ROLANDGANG" are grabbing their guitars and once again going to rip it up in the backyard. Featuring Fernando Norohna these guys are like a match to dynamite and set to blow you all away. Make a note, you do not want to miss it, Deus, July 1, it's a night not to be missed. This is gonna be one of those nights that make our Sunday Sessions infamous! Wrapped tightly around these two acts making the night one cohesive force will be the DJ set by "LOS BRENGOS" who will be twisting out tunes on the wheels of steel. 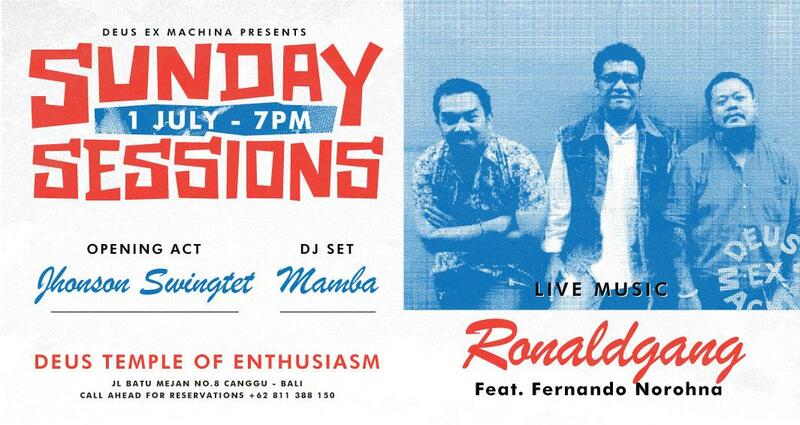 If you are around in Bali, head on over. It’s set up to be a night par excellence. They have drink specials all night long. If you’re looking to combine it with dinner, their restaurant is open until 10:30pm. Late night snackers they serve pizzas until close. Sunday Brunch Dim Sum All You Can Eat Extravaganza! Sunday Roast Dinner night is back!